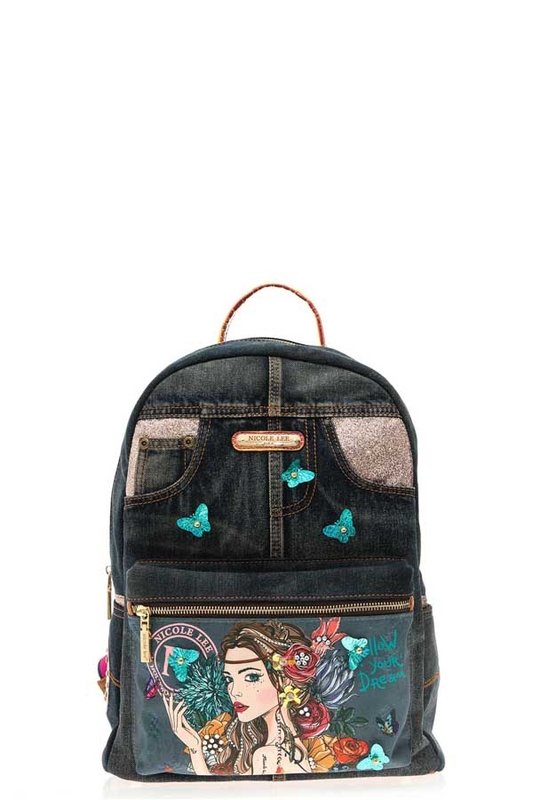 Follow your dreams in style with the Nicole Lee "Angelina Follows Dream" Denim Backpack. Exterior Features: Made of vegan denim with vegan leather detailing. "Angelina Follows Dream" print at front. Butterfly appliques. Open side pockets. Extra zip front and back compartments. Metal zipper closure with NL monogrammed zipper pull. Top handle. Adjustable backpack straps. Structured silhouette. Protective metal foot base and NL nameplate at front. Vegan leather handle with 4.5" inch drop. Adjustable 27" - 34" inch backpack straps.